The western shore is Connecticut's Gold Coast, the eastern shore genteel Southeastern Connecticut—with casinos. In between is a rich stretch of Connecticut history and a wealth of natural beauty. The Connecticut shoreline extends from posh, exclusive Greenwich just northeast of New York City in the west to charming, historic Stonington on the Rhode Island state line in the east (map). The western extent of the shore, from Greenwich to New Haven, is heavily urban, with the commercial and industrial centers of Stamford, Norwalk and Bridgeport, Connecticut's second-largest city. Frequent train service makes these Connecticut towns outlying suburbs of New York City. Hammonasset Beach State Park, east of Guilford, with its fine long sand beach on the (relatively) warm waters of Long Island Sound, is a favorite resort in the heat of summer. The lower reaches of the mighty Connecticut River have their own charming towns, many having grown rich on shipbuilding in the 1700s and 1800s and one—Old Lyme—on art. East of the Connecticut's mouth, New London and Groton prospered by making helicopters and submarines. Near the shoreline's eastern boundary, Mystic was a famous seaport in colonial and early American times, and is now famous for Mystic Seaport, a living museum of Connecticut maritime history. 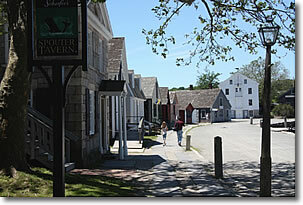 Above, Mystic Seaport takes you back in time. Connecticut and Napa Valley vintages.